Claim Settlement Ratio is probably the most important factor while buying insurance. This becomes even more critical for Life Insurance as you would like your dependents to run pillar to post to claim your sum assured in case of unfortunate death. The recently published Insurance Regulatory And Development Authority – IRDA Annual report 2011-12 has the death claim settlement ratio for the following 24 life insurance companies in India. 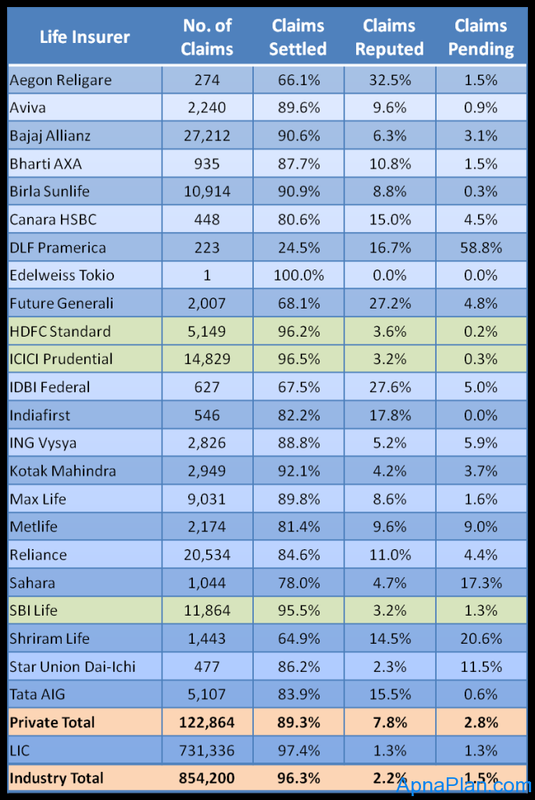 ICICI Prudential, HDFC Standard and SBI Life have claim settlement ratio of more than 95%. ING Vysya, Reliance, Tata AIG, Metlife, Sahara, Future Generali, Shriram Life have more than 1000 claims and still low claim settlement ratio. You can read the previous Claim Settlement Ratio for Life Insurance Companies for 2010-11 and 2008-09. This is nice information and I would prefer companies with high settlement ratios. Don’t want some one to run around in case I am not there…. Thats true… death settlement ratio is very important while taking life insurance. Another reason for the high claims rejection for the private players is the introduction of the online term plans. While filling the proposals, personal details are not filled in properly and treatment details are missed out. In the case of an early claim, the companies will reject the claim easily due to non disclosure of material facts. There is no meaning in going for a company with high claim settlement ratio. The MOST IMPORTANT thing is to give full disclosure at the time of taking the policy. The regulatory mechanism and consumer courts are very strong in India to protect the customers interest. But the customer has to do his part correctly at the time of taking the policy. You are absolutely right that customers should honestly declare everything to the insurance company to avoid disappointment at a later stage.